I felt a little guilty for missing out on the second instalment of the Made in Brooklyn series this morning, so I’ve been on the hunt for a film this evening as a means to make amends. Given we don’t like to regurgitate content here I felt it was best to wait and see what else was around, so with this project highlighting the craft of Japanese creative Chifuyu Enomoto I’m confident this was worth the wait. Throughout the platform it’s quite obvious we have a huge admiration for Japanese design/craft so this project fits right into our growing archive. 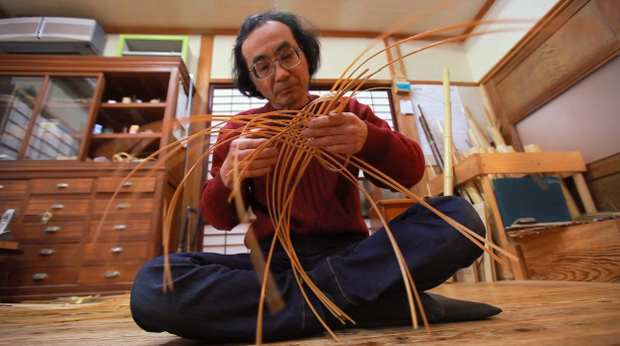 I’m sure you will appreciate the skill of Chifuyu as he puts together a bamboo basket by hand, over the eight minutes we’re taken through the entire process in almost real time with lots of traditional techniques on show. One thing that really amazed me was how thin and flush Chifuyu got the material using simply the humble blades in front of him, my favourite section has to be when he hammers the two blades into the block as I’ve not seen this technique used much before. It’s projects like these that really make you apreciate a handcrafted object, perfecting such techniques like we see in the video takes hour upon hour of practice and is in my opinion a delight to see unfold. Concluding our posts today I’d just like to say a massive thanks to Tramnesia who have once again brought us all another fantastic filmed project. Without collectives like these folks we wouldn’t be able to visit traditional Japanese craft in the same way which I’m sure you’ll agree would be a terrible shame. If you don’t follow Tramnesia already I’d recommend doing so if you enjoy this below, they consistently inspire us here and I’m sure they will do the same for you too.